This picturesque luxury camping site is less than 2km from the sandy beach and sparkling Atlantic ocean. With fun for all the family, it has every activity on offer to make your camping holiday one to remember. The pretty fishing town of Saint Gilles Croix de Vie is only a walk away, and cyclists will love to pedal through the beautiful scenery that surrounds the camp. Book your relaxing holiday at Domaine de Beaulieu with LuxCamp and experience everything they have to offer. This idyllic luxury camping spot makes provides everything you could need during your holiday including sports for the kids and places for adults to unwind. 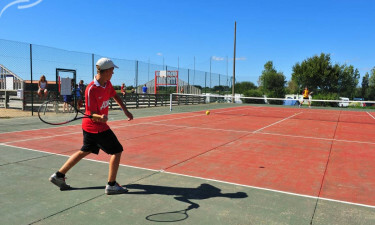 Why choose Camping Domaine de Beaulieu? Stay in a comfortable mobile home and you can enjoy all the amenities and services that this lovely site has to offer. 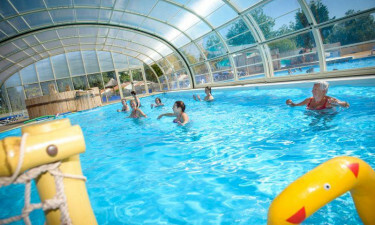 The on-site pool complex has a large main pool, as well as a paddling pool for little ones, a bubble pool, a large slide, and a covered area. Saint Gilles Croix de Vie beach is just 1.5km from the site and offers the perfect spot to unwind, or to take a dip in the ocean.